Redi Tlhabi was referee in the intellectual (mis)match between Prince Mashele and Charles Nqakula at the Open Book discussion on the future of the ANC. 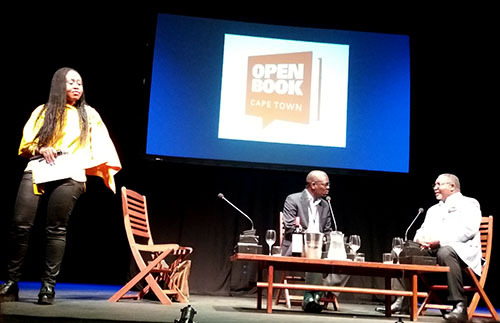 The intellectual boxing match between Prince Mashele and Charles Nqakula at the Open Book festival’s Fugard Theater main stage yesterday evening provided fascinating insight into the battered politician syndrome. Radio talk show host and author in her own right, Redi was the referee, although she was biased to Prince, her reason not having been bought by the Guptas. Unlike the ANC leadership in power, she still has ethics. Mashele, who is executive director of Centre for Politics and Research, and has authored a book called The Fall of the ANC, pulled no punches on stage with Charles, who married himself to the struggle while still a journalist in the early ‘70s, served in MK, came through the ranks of the SACP in the early ‘90s, was a National Executive Committee member of the ANC, an MP under Mandela, Minister of Safety and Security under Mbeki and Minister of Defence under Zuma. He is now High Commissioner to Mozambique and has written a book called The People’s War: Reflections of an ANC cadre. It was fascinating to see a man, punch drunk from the blows landed by his own cornerman, coach and team meates, attempt to bob and weave in defence against the jabs, hooks and uppercuts landed by his intellectual oppenent. If Redi had been kinder, she would have focused more attention on his book, which, although I haven’t read it yet, is no doubt a fascinating insight into not only the ANC, but the myriad stories of the underground and tragedies and triumphs and solidarity and insecurity of fighting a deadly struggle against a mighty and well-organised state. But we’re living under an ANC that is, not an ANC that was, and the ANC now is corrupt and selfish and throttling us in its own fight over access to resources and wealth. Charles could choose to walk away from the ANC now. Doing so wouldn’t take away his achievement within the SACP and the ANC then. But he can’t, it seems. Prince spoke straight-up about the deep, and his view unresolveable issues within the once-great party that governs us, providing reasons as incontrovertible as the weekly headlines on City Press, Mail&Guardian and Daily Maverick (even often on the New Age and Iqbal Surve’s lapdog publications too, actually) as to why the ANC is too far gone to ever recover its moral code. Yet Charles believes that the good people in the ANC will turn the party around at the coming December conference when a new leader is elected. Zuma will be out, thank god, and Ramaphosa will be in, he said, in not quite those words. And this “new leadership” (Ramaphosa) will start their cleanup campaign. “There’s lots of interaction between the provinces, to find common cause, to find the ANC’s core (values) and to take the ANC back to where it was,” said Charles. He compared this to the mid-’60s when the ANC leadership lulled and was goaded back into action at the First National Consultative Conference in Morogoro, Tanzania in 1969. Prince came back with a tight left jab: “In the ‘60s, you didn’t have members of the ANC killing each other because they want jobs (In his book Hitmen for Hire, Mark Shaw writes how over 450 councillors and local civil servants have been the victims of political assassinations over the last decade, and that does not include “the flurry” of killings ahead of last year’s municipal elections). Moving up the ranks back then marked you for arrest, torture, and possibly death, not tenders and kickbacks, punched Prince. But like an abused spouse who clings to the idea of the sanctity of marriage, Charles wouldn’t budge. The new national leadership will clean up the branches, and the regions, and the provinces, from the top down, he believes. Only, he seemed willfully blind to the illogic of his own statement that in the ANC, it is branch leadership that elects regional, provincial, and national leadership. So if the branches are corrupt, his supposed clean national leadership is pie-in-the-sky. Nevermind that in the over 450 political assassinations, it wasn’t the good guys in the ANC paying hitmen to take out the bad guys. His level of delusion was fascinating, all the more tragic for him seeming such a steadfast, loyal, committed man. One of the ‘good guys’, who has put his life on the line for the party, but cannot grasp that he and his fellow veterans are now barely even wallflowers, shouting vainly to be heard over the cacophonic clatter of cash being transferred into the accounts of the corrupt. Although most of us would love Charles to be right, that the ANC can be saved – for it would possibly spare us a lot of bloodshed and bankruptcy – the 300 or so of us watching the spectacle were shaking our heads in a collective disbelief. We all know it’s going to get worse, probably much worse, before it gets better. In fact it might only get better after the ANC has completely self immolated and is merely a pile of ashes, perhaps we should simply urge them to get on with it. But the DA then, or the EFF? Eish! And as Prince pointed out, even if Ramaphosa does win and he goes on a purge, the people holding onto all those lucrative contracts and looting our coffers are not going to simply fold their arms and go to jail. No chance, china. From the outside, it is easy to say that Charles should cut his losses, walk away from the party and console himself with the fact that his marriage to it assisted in toppling apartheid and ushering in a democratic government, and it’s not his fault it became corrupt. But we have no conception of the loss that would entail for the man. Unfortunately, it is because of this very inability to face that loss, that the ANC will probably still win the next election, although their majority will slip into the low 50s. In that likely scenario, Prince points out they will become a rural party, already having lost the urban vote in Gauteng, and Nelson Mandela Bay, nevermind Cape Town. Do I need to mention that Zanu PF is a rural party? Barring a miracle, it’s going to be a rough and bloody ride. There’s 18 more events at Open Book today, Sunday 10 September, the last day of the this scintillating celebration of literature, poetry, comics and discussion happening in Cape Town. Check out the programme here. The Gruffalo: Kids of the world unite!